I’ve never been a frequent visitor to Singapore but the lure of the majestic, iconic Marina Beach Sands Hotel, of which I had heard so much about, made me look forward this time round, to visit it again for the tenth edition of the Asia-Pacific Amateur Championship (AAC) to be played at the New Tanjong course at Sentosa Golf Club from 4th to 7th October 2018. Founded in 1974, the Sentosa Golf Club in Singapore holds both a rich history and a very modern outlook. Voted as the best golf club in South East Asia, it offers phenomenal courses with scenic views for golf aficionados. The small island state, just thirty miles across and seventeen miles North to South did not disappoint me with its towering, glinting skyscrapers, bustling streets, lovely gardens and amazing food. Weather wise, being almost on the Equator, Singapore was hot and sultry but it didn’t distract me from focusing on the game. 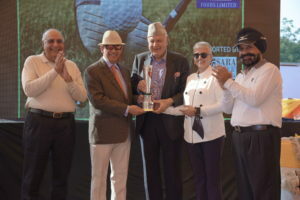 The AAC is an annual amateur tournament organized by the Asia –Pacific Golf Confederation (APGC) in conjunction with The Masters Tournament and the R&A, organizers of The Open Championship. It is played at different location throughout the Asia Pacific region and considered an elite event by the World Amateur Golf Ranking, in that the AAC players, like players of the US Amateur, British Amateur and European Amateur are eligible to be ranked. Another reason why the AAC gains significance is because the champion earns a direct entry/ invitation to the Masters Tournament at Augusta and a place in The Open. The runner(s)-up gains a spot in The Open Qualifying Series. The AAC has proved to be a springboard for players such as two-time Japanese champion Matsuyama (2010 and 2011) and China’s Guan Tianlang, the Winner in 2012 who went on to become the youngest player ever to make the cut at the 2013 Masters at the age of fourteen. The original idea of the tournament was to create heroes who would make the region proud on the world stage, and the ACC has done just that by creating exceptional champions each year. 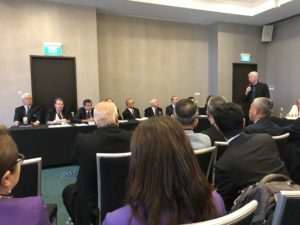 In fact, the APGC Chairman, Mr Kei Muratsu remarked that the quality of the field hosting and celebrating a decade of the ACC in Singapore just showed how important the tournament had become for the region. The 72-hole stroke play event at the New Tanjong course lived up to its promise to be a real festival of golf in the special year of the championship as it celebrated its 10th anniversary. The Founding Partners of the AAC were very happy with the manner in which the region’s finest players had responded to the championship in the first decade of its history. A full field featured 120 top men’s amateur talent representing 40 of the Asia Pacific nations which includes Australia and are a part of APGC. As many as 17 players in the field fell within the top 100 of the World Amateur Golf Ranking led by China’s defending champion Lin Yuxin. Also in the field was Australia’s Min Woo Lee, ranked world no.12, the highest ranked player in the region, Thailand’s Sadom Kaewkanjana, Asia’s number one and ranked 14th in the world, Jin Cheng, China’s number one amateur player ranked 20 in the world and Rayhan Thomas, the highest ranked player from India and ranked 22 in the world ranking. The Asia-Pacific Amateur Championship is supported by six Proud Partners – AT&T, 3M, Mercedes-Benz, Samsung, Delta and UPS – and two Scoring Partners, Rolex and IBM. It was so heartening to see Fred Ridley, Chairman of The Masters and Martin Slumbers, CEO of the Royal & Ancient and their teams attend the AAC tournaments. They were not there for a day or two as mere spectators but were present for the entire week observing, motivating, advising and supporting the players and the officials. They gave instant credibility, value and reputation to the championship and made it worthwhile for all elite amateur players throughout the region to compete in it. According to Martin Slumbers, the AAC was an opportunity to inspire the next generation of players and create a platform to develop the best players in the region. Fred Ridley proclaimed that he was pleased to see the impact the event has had on golf in the region. “We started with the idea of creating heroes and role models so other young people would be inspired to take up the game, and I think all of that is coming to fruition” he observed. 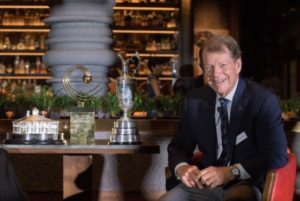 Sentosa Golf Club’s Andrew Johnston wears several hats at the club and is instrumental in redesigning the two courses, Serapong and the New Tanjong. From the age of 14 he had dreamt of becoming a golf course architect and was fortunate to work as a Project Manager for nine years with the legendary Arnold Palmer, globally renowned for the role he played in growing the game of golf. Johnston went on to help Palmer create many of his masterpieces. The New Tanjong course that Johnston provided had all the drama and excitement required to stage the prestigious tournament and when challenged, it did not not just feel like a professional event, but also played like one too! The course was in immaculate condition, prepared and presented beautifully by Johnston which in turn rewarded good play. The challenging course really put teeth into the game. The players had to have a sound plan and the ability to master the greens. In fact the greens were the biggest challenge. They were redone and designed not with steep contours but made difficult with subtle movements that players had to be really good at reading. The course did not lend itself to someone who just hit far but to those players who had to be good strategic thinkers as well, who could understand their zones and use their irons accurately. The organizers did not leave any stone unturned to host a perfect tournament. The amateurs were accorded a fabulous welcome with goody-bags filled with give-aways like T shirts, caps and badges. The players were feted and photographed, their travel and hospitality taken care of. A Media Centre was put up for individual interviews, photographs and Question-Answer sessions, as the players arrived. Everything worked to clock-wise precision. 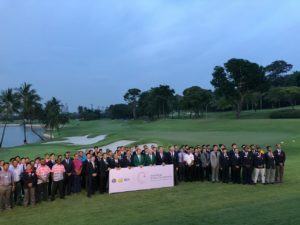 Besides offering a truly memorable golf experience, the Players and Officials were invited to a Welcome Reception on Wednesday at the Sentosa Golf Club, Serapong Course. The excellent banquet facility, served cocktails and heavy Hors D’oeuvres. It saw players break the ice, mingle and relax- truly, a well thought-of beginning to the Tournament. It was not only the financial aspect, but the energy and the enthusiasm and the commitment to make every amateur player feel important and experience what it is to be a top professional that was greatly appreciated. It added glitter and glamour to the event. I’ve never seen a team right from the top to the staff work so hard to make the players feel so much like royalty! The beautiful driving range was even more personalised by the colourful flags of participating nations. On Saturday the APGC organized a gala dinner, a formal jacket and tie affair at the incredible Marina Beach Sands Hotel. It’s a modern day wonder with more than two thousand bedrooms, shopping mall, multiplex, infinity pool, bars, restaurants and museum, accommodating about 5000 guests at one time. The venue of the fantastic dinner was the Ce La Vi on the 57th floor of the hotel, made exclusive by reserving the entire floor for the players, officials and guests. Besides the imaginative and exceptional culinary delights, what was mind-boggling was the panoramic view from the large bay windows. One could soak up Singapore’s fabled night life, the striking night time cityscape, the cool blend of impressive modern skyscrapers and old colonial buildings, the shops and cafes. A memory that will live on was watching the sunset earlier in the evening when the blazing sun was slowly being devoured by the sea! A treat for the participating golfers on Saturday was an interaction with Tom Watson, the living legend who has won five British Open Championships, two US Masters and one US Open, at the out-door Practice Range; but to our good-fortune there was a wee bit of lightening far away in the distant and the safety norms for typhoon procedures are so strictly followed for the safety of players and staff that the venue of the interaction was diverted to the Dining Area. The players were able to get together and relish a hot delicious lunch. Tom Watson went from table to table shaking hands and speaking to them. 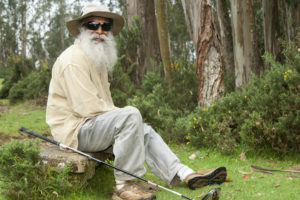 He had one piece of advice for the amateur golfers- there is no short cut to success. Borrowing from his own life, something he said to them over and over again was “Never Give Up”. Legend has it that Tom’s father often told him that to be a true golfer he had to win his own national golfing event. Back in 1982 while playing the Open his game wasn’t going well; but he managed to score and stay put in the tournament. Then the moment of reckoning arrived. On the final day, on the 17th hole, a par 3 of the Pebble Beach course, the ball didn’t hit the greens but instead it settled into the thick treacherous rough. Getting an up and down from there was almost an impossibility. But instead Tom rose to the occasion and played arguably the most memorable ferret of all times! A birdie 2 and with that chip he sealed the win from the Legendary Jack Nicklaus and thus became the National Champion. To this day it’s remembered as amongst the best chip-in shots in the world. Asked what would be his best advice for players, he replied “The one thing that I can tell them is how I made myself into a good golfer. When I decided to turn professional, I decided I would practice more than anybody else on the Tour. I’d hit more balls than others. That I did and it made me a better player. There were many a times when I buckled under pressure but I learnt to deal with it. The main thing is that you have to strive to be better and better and better.” Watson wholeheartedly endorsed that the Asia-Pacific region would become a superpower in the game in very near future. On Sunday, Takumi Kanaya followed in the footsteps of his renowned countryman Hideki Matsuyama when he won the 10th Asia-Pacific Amateur Championship. Continuing his impressive form, Kanaya wasn’t fazed by the suspension in play due to inclement weather. Following the hour delay, he powered ahead of the field with three consecutive birdies starting at the 14th hole, he went on to finish two strokes ahead of India’s Rayhan Thomas and compatriot Keita Nakajima. Kanaya earned an invitation to the 2019 Masters Tournament and a place in The 148th Open at Royal Portrush. As runners-up, both Thomas and Nakajima got the opportunity to play in The Open Qualifying Series. “This is simply like a dream. I have been dreaming of going to the Masters ever since I was a kid,” said a delighted Kanaya, who received a congratulatory call from Matsuyama moments after winning the championship. The win makes Kanaya the second Japanese after Hideki Matsuyama to win the AAC but it was the third time that Japan lifted the title with Matsuyama winning twice in 2010 and 2011. Thomas was disappointed with the four-over 74 start he had in the first round, which eventually made all the difference. He, however achieved the best-ever finish by an Indian in the decade-long history of the championship. “One thing I definitely learned from this week is that you can’t win a championship of this level after starting with a four-over round,” said Thomas, who made only one bogey in his last 45 holes. He added that he loved every moment of the championship knowing that he had the ability to win when he came back next year. Overall it was India’s best ever AAC with five of the six Indian players making the cut to play that week. Indian teenager Rayhan Thomas who came within striking distance of creating history before finishing tied 2nd at the AAC was followed by Kartik Sharma tied 13th at the bogey-bogey finish. Yuvraj Sharma also dropped two shots in the last four holes and finished tied 25th while Kshitij Naveed was tied 38th and Varun Parikh was tied 57th. Thomas fought back from a disappointing 4-over on the first day and was the only player in the Top-6 to have an over par during the week. “The second place means a lot to me. After the disappointment of the first day I proved I could come back so close” he said to applause all around. Representing the IGU at various tournaments across many countries, meeting, recognizing and interacting with officials, a reunion of sorts from event to event, has enriched my outlook on the world of golf. It’s a pleasure to meet men who have the mental and moral strength to be good leaders and observe how they push things through, get things done and make things happen to desired effect. Being in touch with such leaders of the game has not only sharpened my analytical skills but helped me to better understand the challenges and complex dynamics of the game- a learning experience indeed! The Prize Distribution, as part of the closing ceremony was a perfectly conceived and executed formal affair in the presence of Founding partners Fred Ridley, Chairman of The Masters, Martin Slumbers, CEO of the Royal & Ancient, Kei Muratsu, Chairman and Taimur Hassan Vice-Chairman, APGC, from Pakistan. I had a wonderful opportunity once to meet Taimur in Scotland in 1990 along with my good friend Uttam Mundy and reminded him of the occasion. He was amazed at the memory recall. It gave me a sense of pride seeing someone from our neighbouring country seated along with the Founding partners of the APGC. A key reason for the prestige of the AAC is the prizes that are on offer. The winner of the tournament receives an invitation to compete in the 2019 Masters Tournament plus a direct entry into the 148th Open Championship at Royal Portrush in 2019. The runners-up receive a place in The Open Qualifying Series with an opportunity to qualify for the Royal Portrush. The incredible opportunities reflects the changing dynamics of global golf and the kind of success this tournament has had in encouraging elite amateur golfers to flourish across this region. 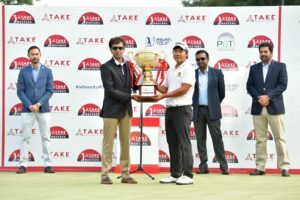 The Asia Pacific Amateur Championship is now regarded as one of the world’s premier amateur events and it will continue to grow in status whilst quality courses in the region are selected as venues. It will also showcase how quality golf courses can be created in diverse environments and climates. As golf continues to grow in the emerging markets of the Asia- Pacific Region we can expect to see new venues created to cater to the inevitable growth in golf’s popularity. Previous Post The Expat Cup 2018 - Team Korea wins!